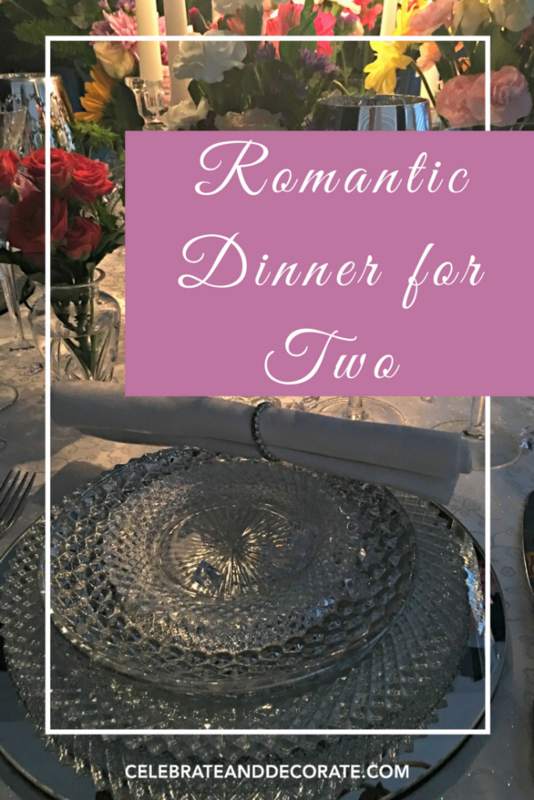 Valentine’s day is coming and I decided to host this blog hop around a romantic table for two. 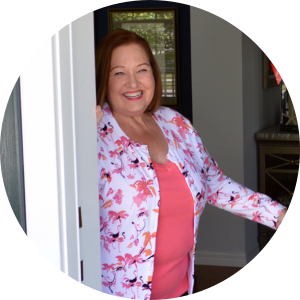 I believe that staying home for Valentine’s day is one of the most romantic things you can do, just the two of you, enjoying one another with no pesky servers or a bill at the end of the dinner! It is crystal clear to me after almost 37 years of marriage that I am more in love with my husband today than ever. I selected crystal as the theme for my table. I thought I had my table all planned out, crystal, a little silver and then I would add red or white roses. I looked at my table and thought that wasn’t going to do it, this table needed an explosion of color! Off to pick up flowers in all of the colors I could find! I just picked up several mixed bouquets at the grocery store and arranged them in a variety of my crystal vases and bud vases. My place settings are mirrored chargers that have a lovely ring of rhinestones in them even though you can’t see those. I topped those with Miss America pattern dinner plates, my often used silver salad plates and topped those with the same depression glass dessert plates. I used a variety of stemware, silver goblets from Home Goods, Waterford Champagne flutes and Bohemian crystal water glasses. A crystal candy dish sits by filled with what else? Kisses! But the magic really happens when the sun sets and the candles are lit! Have you ever eaten just by candlelight? I don’t know that we have ever done this and it is going to be so lovely, I am looking forward to this, even if we are doing it a little earlier than Valentine’s Day. 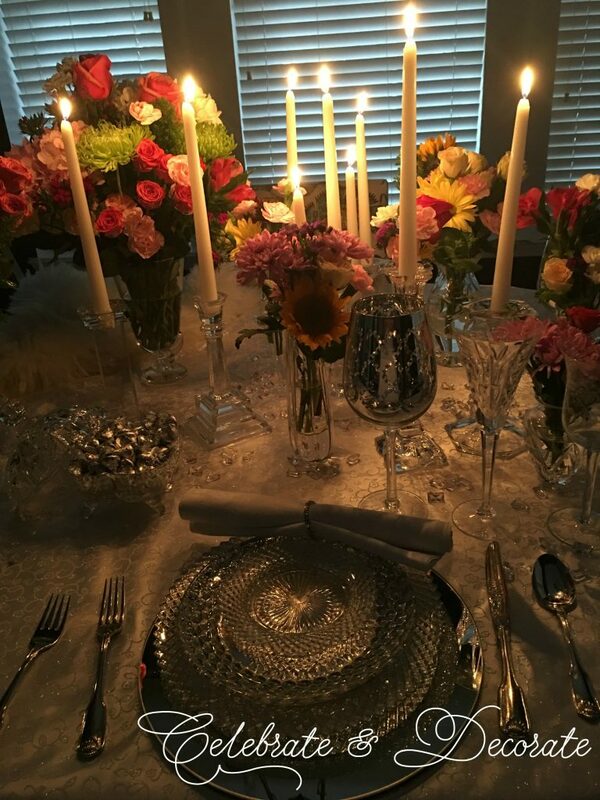 I am so happy to be able to set such a pretty table and then serve up a delicious dinner to my sweetheart! 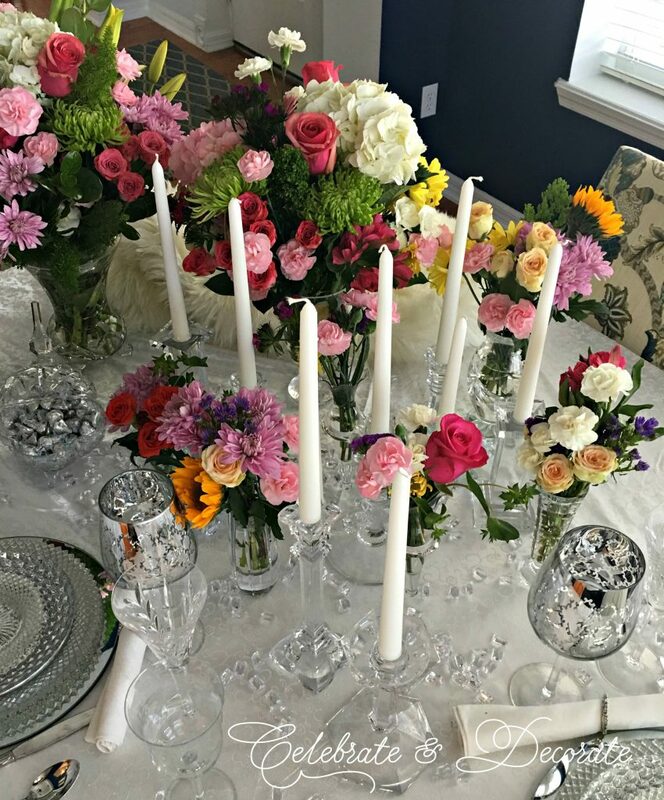 If you haven’t had a chance to yet, please stop by and visit the blogs below and see how everyone interpreted their own vision of a romantic table for two. Oh Chloe, that’s so beautiful! 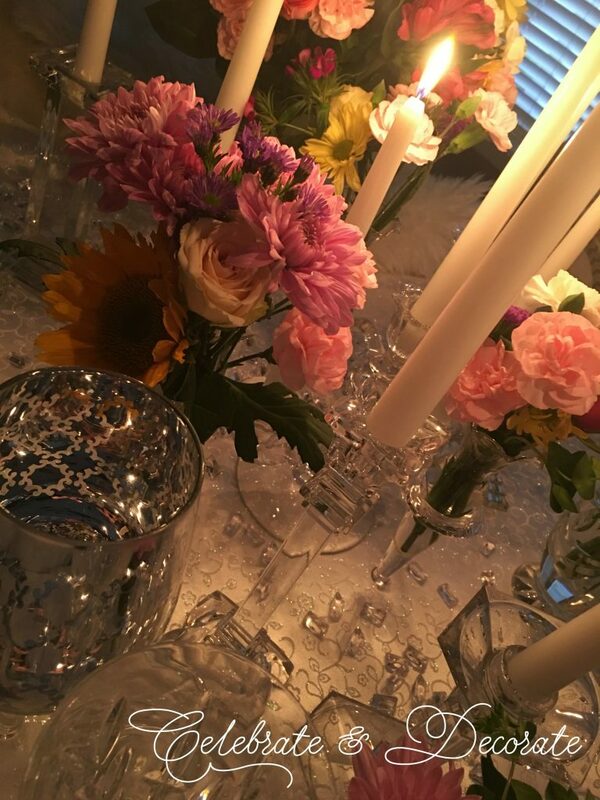 Your flowers and candles have elevated this already pretty table to a stunner! Thank you so much for being our wonderful host for this blog hop. I have so enjoyed each blogger’s personal interpretation, along with their personal thoughts of sharing love. It was a privilege to be a part of it. Chloe, your crystal and silver table is so gorgeous, but the explosion of color adds the perfect element. 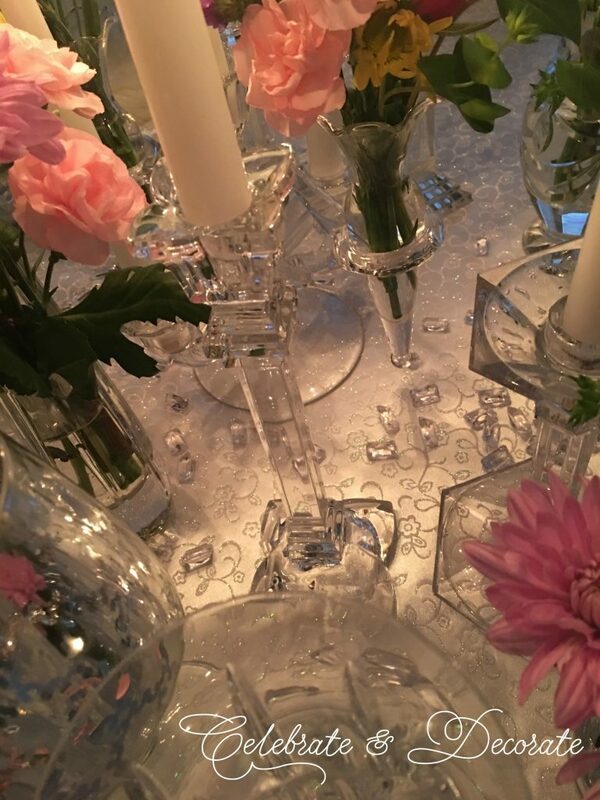 The crystal just sparkles and exudes romance and then once the candles are lit, it becomes magical! I know you and your husband will enjoy sitting down here for a lovely meal at home! Thanks once again for being a fabulous hostess for the Table for Two Blog Hop. It has been a pleasure to be in the company of so many talented ladies! Thank you so much Pam for your kind words and thank you for being a part of this sharing of ideas and stylings! Thank you so much Mary! I so appreciate you participating and sharing your stunning tables! Chloe, you had be at silver and crystal. Two of my favorite things and you can’t have too much. I love how the burst of color in your flowers pops out against the sparkle and reflection of the crystal and silver. We try to eat in the dining room every Saturday night with the chandelier dimmed and the candles lit. It really does create a sense of quiet and no distractions. 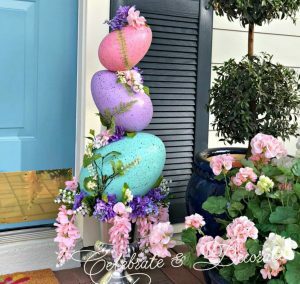 Thank you for once again hosting a fabulous tablescape blog hop. Thank you Carol. I couldn’t believe after styling the table it was missing something. The colorful flowers really helped. What a lovely tradition every Saturday! Good for you! We are often entertaining clients on the weekends, not too much quiet time for me! I don’t believe I’ve ever seen a more beautiful table of crystal. 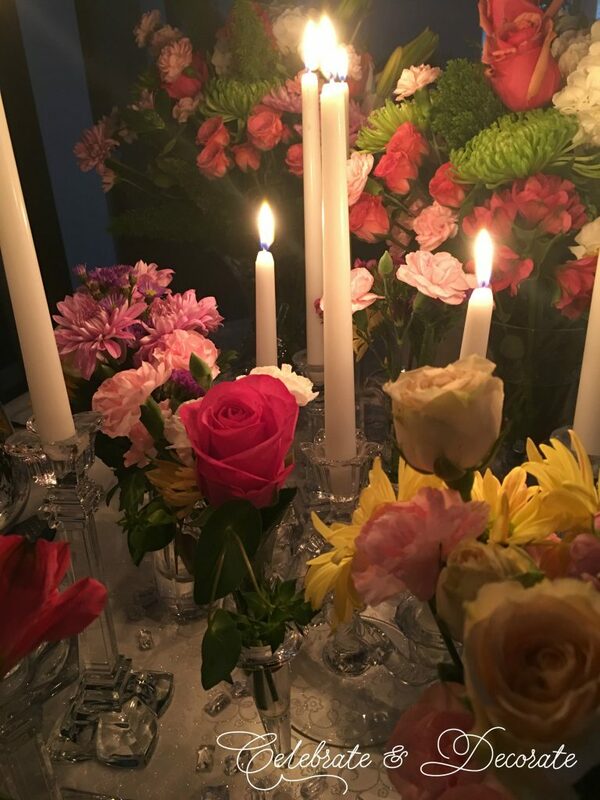 The colorful flowers are the perfect addition, especially beautiful in candle light. Your table is gorgeous in silver and white, but wow when you brought in the blooms it really exploded! Nothing says romance better than candles, flowers and bling! 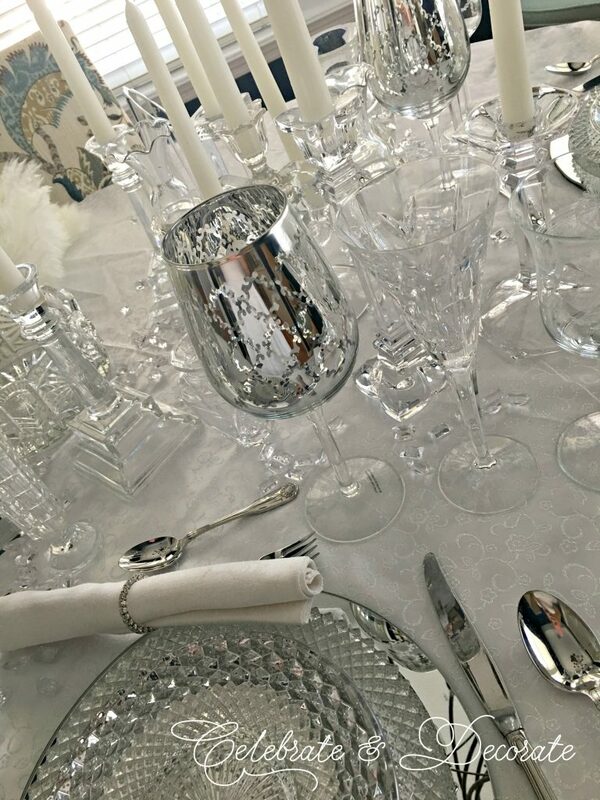 I especially love the silver goblets, it is all stunningly beautiful! Thank you so much for being our fearless leader and arranging these hops, it always gives me extra motivation and inspiration! Wow, Chloe! So elegant and romantic. I just want to give you a hug. You tickle me how you can get more on a table. I mean that in a nice way. Love the myriad of candles and gorgeous explosion of color and gorgeous flowers and crystal. You have a lovely collection of candlesticks and goblets. What a clever thought to have a candy dish full of “kisses” on your table. Your plate stack is amazing! I could go on and on about it. Thank you for your energy and enthusiasm coordinating your blog hops. It is rewarding to learn from each other and be inspired and for the friendships made. Thank you Bonnie! I wold love that hug! Sometimes I overdo it on my tables, often I look at a table and start removing stuff! Thanks for being a part of the hop! Beautiful, Chloe! Love all the flowers with the crystal. Oh my gorgeous! This is simply stunning! I love everything, but like so many others have said, once you added the bouquets of flowers, you took your table to whole new level. So very pretty. 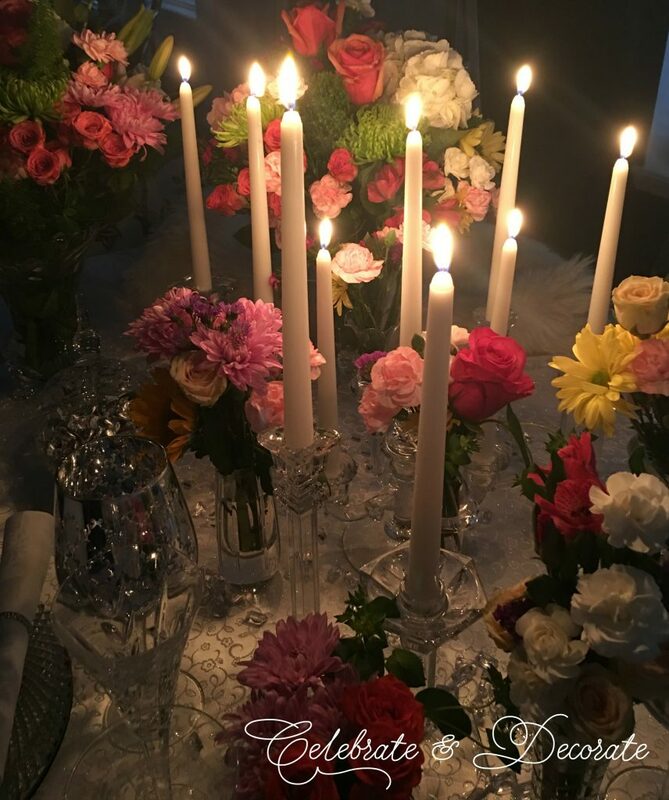 Thank you so much for hosting this bloghop and for being such a great example to us all on how to set a romantic table for two. This has been a fun week of great inspiration. Thank you so very much Kim! I knew it needed something else when I decided to add the flowers. Thanks for being apart of the hop! Wow Chloe- you went all out! 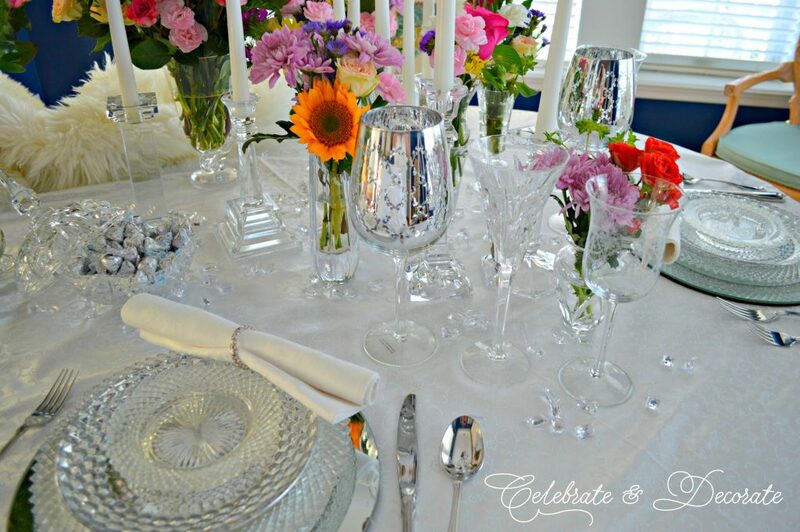 Love the explosion of floral color and of course all the pretty crystal accents and dishes! The tablecloth is beautiful too- it shimmers in the candlelight! We’re in on 38th year of marriage soon to be 39. Hard to believe isn’t it! Thank you Liz, the tablecloth is really just a piece of fabric hemmed put over a white tablecloth. Happy upcoming anniversary to you! How does it happen?! Chloe, I think we are kindred spirits when it comes to loving color. 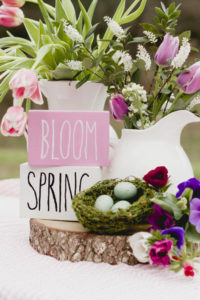 I love all of the color that you added to your table with the gorgeous flowers. It is stunning with the gorgeous crystal….talk about a glamorous table! You have done a beautiful job. Thank you so much for hosting these blog hops. I always have so much fun, and I am always in awe of the amazing talent. Thank you Shannon. I was going to go with the all white and crystal, but it just didn’t cut it! You are so very kind! Chloe your table is shining and is so gorgeous.I love your cristals and your miror charger is something special.I would like to se the chrger how it looks without plates on it! It gives that splendid look to the table .It was my pleasure joinning this wonderful group. Thank you so much! I will have to take a picture of the charger, I was kind of disappointed that the rim of crystals didn’t show! Stopping by from the blog hop. Thank you for sharing your table – its lovely! How fortunate your “sweetheart” is to sit and dine at this gorgeous tablescape! 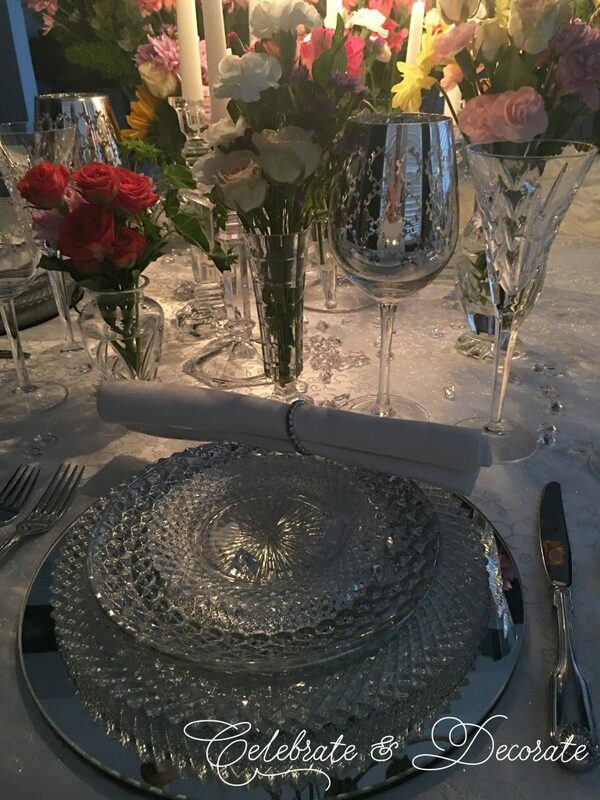 The crystal combined with the silver and mirrors and then the floral arrangements makes the whole table “shine” with love. 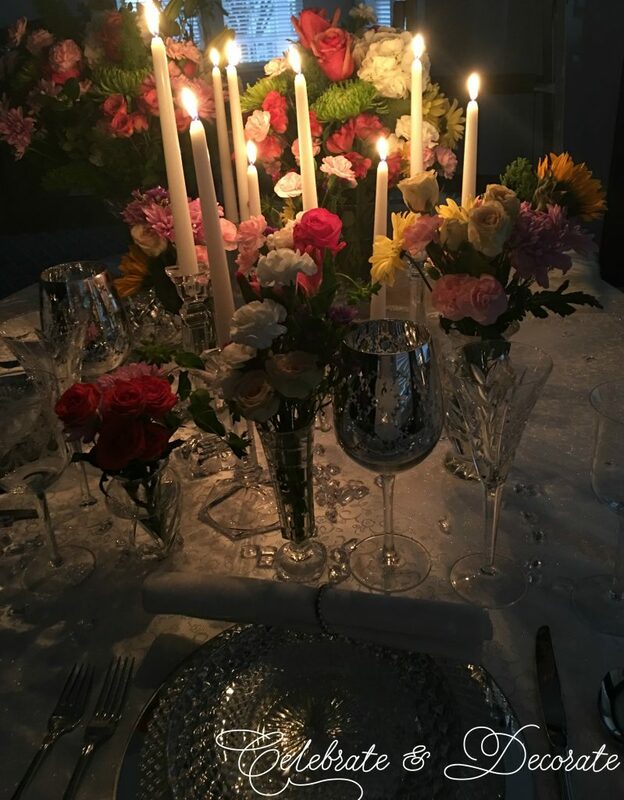 We have dined by just candlelight and it is the ultimate in “romance” even if it does take your eyes a while to adjust so you can see your food 😉 Your photography of the candles glowing is exceptional and the pics capture the exact feeling you’d get enjoying this tablescape. 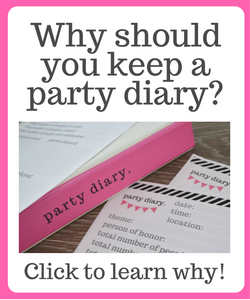 Thank you so much Chloe for organizing this blog hop – I’ve enjoyed every part of it! Thank you Lori! Thanks for being a part of the hops! A girl after my own heart, I love all of the bling on this table! It was gorgeous from the start then you took it over the top with the flowers. The riot of colors here is amazing Chloe! Thank you so much for bringing us together again with another fun and inspirational blog hop. It’s been great! Thank you Sandra! Thanks for being my best and earliest supporter! Chloe, such a beautiful romantic table set for two. Loving the white and silver look, so elegant and regal. Crystal just screams pure elegance. The flowers really set the romantic mood for this lovely table. I love the candlelight photos. Bling is my thing and you have captured this perfectly. A real pleasure to share in this lovely blog hop. Have a lovely weekend. Oh my, I am swooning over all the sparkle and bling on your romantic table for two. You definitely speak my language. 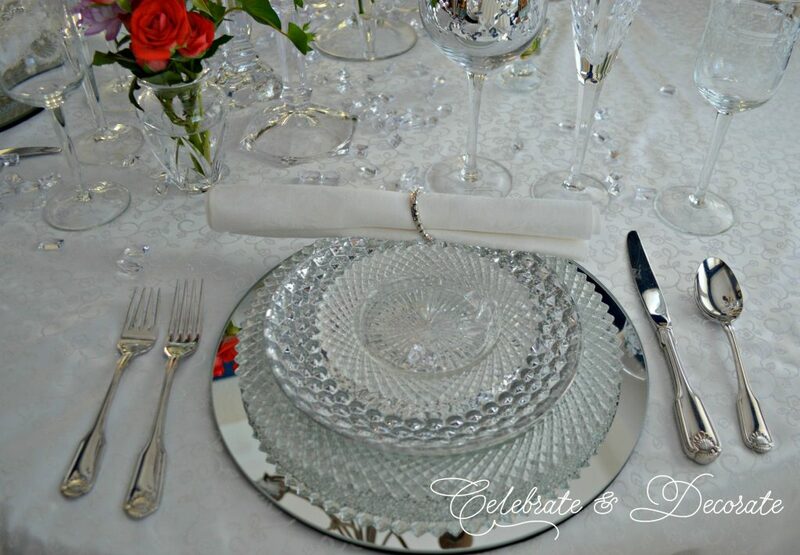 The combination of crystal and silver give your table drama and elegance. And then you take it over the top with the explosion of flowers on the center of the table. This table will surely impress. I know your hubby will be wowed with your table for two. 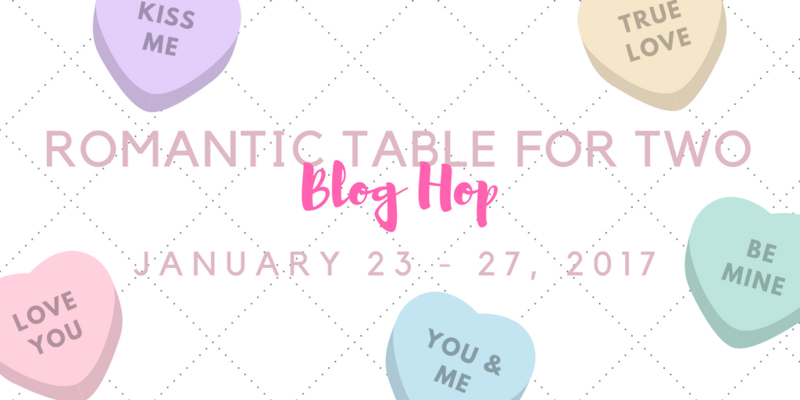 Thank you so much for being n amazing hostess for the Romantic Table for Two Blog Hop. It has been a pleasure to be in the company of so many talented bloggers.